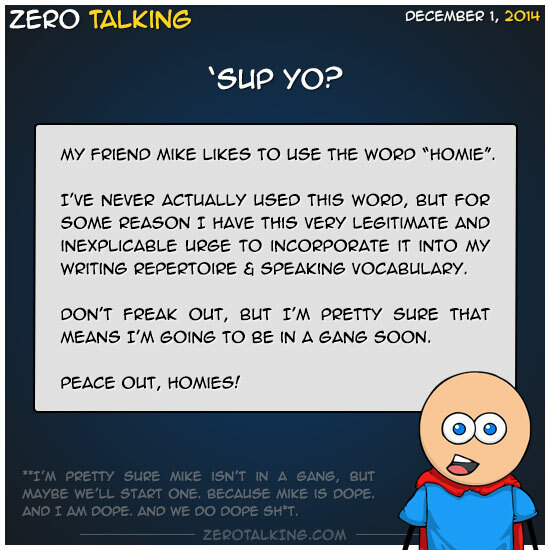 My friend Mike likes to use the word “homie”. I’ve never actually used this word, but for some reason I have this very legitimate and inexplicable urge to incorporate it into my writing repertoire & speaking vocabulary. Don’t freak out, but I’m pretty sure that means I’m going to be in a gang soon. *I’m pretty sure Mike isn’t in a gang, but maybe we’ll start one. Because Mike is dope. And I am dope. And we do dope sh*t.
RE: Homie: an acquaintance from one’s town or neighborhood, or a member of one’s peer group or gang.